This assault back pack from Milspex is versatile and practical bag for the battlefield. The padded shoulder straps, hip belt and back make carrying big loads comfortable, and this bag is pretty capacious to be able to carry a hefty amount of your gear. The heavy duty zippers for the main compartment go down almost to the bottom of the bag, and reveal a large main compartment, inside is a sleeve which can contain a hydration bladder ? the mouthpiece and feed pipe can be fed through either one of two Velcro covered holes, depending on which side you prefer. On the main compartment flap, there are two non-detachable pouches (20x17x8cm) with zip-fastening. 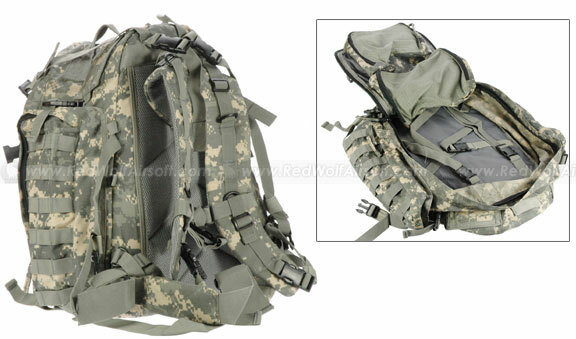 Externally, the front and side pockets have MOLLE webbing, allowing other pouches or accessories to be attached. There is also a Velcro patch for attaching your own logo. The two side non-detachable side-pockets are 34x13x6cm. Main compartment is 46x33x17cm. Made of durable Nylon fabric.